Our program is accredited as an undergraduate university-level degree program by the Canadian Association for Social Work Education. You will be eligible for membership in the Ontario Association of Social Workers both as a student and upon graduation. Also upon graduation, you will be eligible to join the Ontario College of Social Workers and Social Service Workers. We have a long history of combining practical and classroom learning. We have over 100 community partners who help us the provide hands-on experience that is an integral part of our BSW and MSW programs. We believe that social workers must be actively involved in the understanding and transformation of injustices in social institutions and in the struggles of people to maximize control over their own lives. 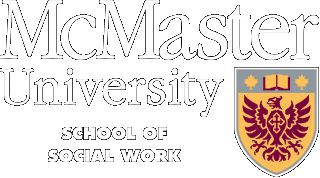 The School of Social Work offers two MSW programs, a PhD program and a Graduate Diploma. Our research topics span social work’s central commitments to respond to individual and social problems and pursue social justice. Our strengths include knowledge mobilization – our engagement with theoretical, applied/professional, community and public audiences. Methodologically, we employ a range of critical approaches that consider power relations in research and practice. Life has a way of coming full circle. In 1975, a scholarship helped her complete her McMaster degree in social work. On her birthday last year, Brenda Symons-Moulton discovered her family had created an award in her honour to support the next generation of social work students at Mac. Take this special topics course for interest, to fulfill a requirement, or to ease your workload next year. Along with Social Work students, students who are not in the Social Work program are encouraged to take this course. Maddie Brockbank (BSW student) and Clare Freeman (Social Work Field Instructor) were recognized last night with YWCA Women of Distinction Awards. What does homelessness look like from the perspective of those who have lived it? Join us for a Canadian Homelessness Film Night at McMaster University co-hosted by Core Collaborative Learning and McMaster Community Poverty Initiative. Filmmakers are either front-line workers or people who have experienced homelessness first-hand. Students who have completed a level I program can apply to the Honours BSW program. The School of Social work aims to provide the milieu and learning resources for students at the undergraduate level to prepare themselves for the general practice of social work. Study is based on a search for the principles of social justice. Preparation for the general practice of social work requires the development of competence in effecting change in a variety of situations affecting individuals, families, groups, organizations or communities in the broader society based on a knowledge of social structure, human behaviour, social welfare services, and social work methods. Students who have completed an undergraduate degree from a recognized university can apply to our B.S.W. post degree program. The School of Social work aims to provide the milieu and learning resources for students at the undergraduate level to prepare themselves for the general practice of social work. Study is based on a search for the principles of social justice. Preparation for the general practice of social work requires the development of competence in effecting change in a variety of situations affecting individuals, families, groups, organizations or communities in the broader society based on a knowledge of social structure, human behaviour, social welfare services, and social work methods. The primary objective of the MSW: Critical Analysis of Social Work is to provide opportunities for students to develop knowledge and skills necessary for the critical analysis of social work, and to examine the challenges and possibilities of working toward more inclusive and just policies and practices in the future. The primary objective of the MSW: Critical Leadership in Social Services and Communities is to foster progressive leadership in the community and social service sectors. This Graduate Diploma offers students the opportunity to develop knowledge and skills in community-engaged research and evaluation, and to contribute to community and agency learning, effectiveness, and change. In this program students who have undergraduate degrees and experience working in social and community services will craft locally relevant research questions and/ or frame evaluation processes useful for both agency/ community and funder purposes, and build their capacities for conducting participatory, justice-focused research and evaluation. The minor in Social Justice and Inclusive Communities provides students with the opportunity to understand structures and processes underlying social marginalization, and to explore the range of ways people and communities work to bring about social justice, equity, and inclusion.